Nintendo 3DS E-Shop Details: Zelda Surprises? 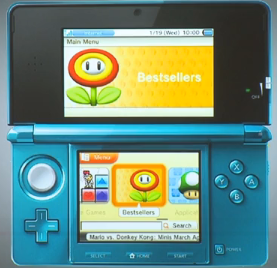 It seems like forever ago when we last got details about the upcoming Nintendo 3DS e-shop. During my recent demo of Ocarina of Time 3D, I got to speak with a number of Nintendo of America representatives and one of the topics that did come up was the 3DS E-shop. In particular, I had asked when we should be expecting the e-shop and also, how it related to the Link’s Awakening re-release. The Nintendo reps confirmed that the e-shop will in fact launch with the update in Late May. However, they explicitly stated that Link’s Awakening had NOT been confirmed for launch. However, with a recent news bit out of Famitsu magazine, it appears another Zelda goody is in the mix. UPDATE: It appears that the release of the e-shop has been delayed and it is now schedule for a June 6th release date. We’ll have more on how this relates to the Zelda titles as soon as the news comes in. I found this newsbit over at CVG and it was originally reported by The Magic Box. Jump inside for details on all the latest goodies. There are several things worth noting in this post. First off, under 3D Classic, the Legend of Zelda is listed as a title that will be available. A 3D enhanced version of the original Legend of Zelda? Could this really be true? A few weeks back, Nintendo confirmed that when the Nintendo 3DS e-shop launches, one of the games included would be 3D Excitebike. Basically, a re-release of the classic Excitebike with updated 3D effects. Does this mean the original Legend of Zelda will have these same updated effects? What exactly will be changed? I’m anxious to find out myself! The second bit of information concerns the Legend of Zelda: Link’s Awakening. The virtual console for GameBoy Color only lists that a demo will be available and not the entire game. Does this mean that Link’s Awakening will not be available on day one? Here at Zelda Dungeon, we were anticipating a late May re-release for Link’s Awakening, but it seems like we might not get that quite yet. Perhaps Nintendo is holding off on the Link’s Awakening release until after Ocarina of Time 3D? The last piece of information is that this firmware update is scheduled for late May in Japan. What does this mean for us folks in America, Europe, and the rest of the world? Will we all be seeing this same firmware update around the same time? Will Japan be getting the E-Shop and these Zelda goodies before us? While it’s nice to have some more information, there seems to be so many new questions have been raised with this piece of information. What is this 3D classic Legend of Zelda? When will we be seeing Link’s Awakening for the 3DS? Will these firmware updates be worldwide? Be sure to let us know by posting in the comments below!